As an issuer of a number of baby bonds B Riley (NASDAQ:RILY) is always of interest to us and as such we wanted to pass along the latest forecast from the company for those that may have an interest. The list of baby bonds outstanding from B Riley can be found here. The new forecast from B Riley raises their projected net income from $14.3 to $15.3 million from a previous projection of $5.4 to $10 million. This is one hell of a jump and the common shares have jumped by more than a $1/share which we believe is an all time high. We have been a bit cautious on B Riley as they are moving into businesses not related to financial services such as the recently announced purchase of voice over internet phone company magicJack. Additionally the company is in the business of helping failed retailers (or their creditors) liquidate inventories such as BonTon which recently filed for liquidation. Obviously with this latest news of raised expectations the baby bonds are in super good standing. Tiny producer and distributor of on line and television programming Chicken Soup for the Soul Entertain (NASDAQ:CSSE) has priced a new cumulative preferred stock issue. The $25 issue will carry a fixed coupon of 9.75% and will pay monthly dividends. The dividends will be cumulative and will be qualified to the extent the company is profitable–otherwise the dividends paid will be a non dividend distribution classified as a return of capital. The new preferred issue has just begun trading under the ticker of CSSEP and is trading around $24.90. While we have not done a thorough analysis of CSSE the 9.75% coupon and the $1.50 underwriting discount (about twice the normal discount) given to the underwriters goes a long way toward letting investors know this is a risky, lower quality issue. We have no interest in purchasing any of this issue. Both equity and interest rate markets were pretty darned tame today–and our feeling is that investors should enjoy tame days when they occur. With the political turmoil we see occurring, plus telltale signs that there are some cracks in the economy, we have the distinct “feeling” that it is going to be a very rocky second half to the year. We see Wells Fargo laying off mortgage employees in the Midwest–300 in total I believe–business is slow. Not a huge surprise–inventories are low and wages simply have not risen much for the “move up” buyer–folks are sitting tight. Today Harley announced they planned to move some production off shore to get around the tariffs imposed by the EU and POTUS promptly attached Harley–we don’t need that and for sure it is something that should have been expected. The ag community is getting crushed as soybean and corn prices have gone off a cliff as the tariffs with China get closer and closer (a July 6th effective date). This is just 6 weeks after prices spiked higher on news that China was doing away with ag tariffs in exchange for an agreement not to sanction Chinese company ZTE. Many people in non ag states believe that poor farming profits have little affect on them personally you can be certain that deep troubles in the midwest reverberate through the entire economy. Even with this turmoil markets are looking for an interest rate increase in September–although the more turmoil that occurs, the higher likelihood that the FED could take a pause. This is one that is yet to be determined. And of course we have the political turmoil. In one breath I am disgusted with the behavior of supposedly semi intelligent people–then I stop and think about the activities around Viet Nam in the 60’s and early 70’s. While I wasn’t a big anti-war protestor as I was a couple years too young my first year of college I did participate in some–lots of angry people. So I guess now, like then, will pass and all will be better. Pour on top of the items above the budgetary problems of the country–including Social Security and Medicare and we about have our hands full. Not certain how these will be resolved in the current environment, but at some point congress, with a gun to their collective heads, will come together for at least a partial fix. So with this laundry list of items we now are starting to feel less confident in our prediction of a 10 year treasury at 3.25% by the end of the year. The more global turmoil the more folks move to the safe haven investment of U.S. treasury debt–guess that’s good since we have more than enough to sell to them. When the Enhanced High Yield Porfolio was set up our intention was to have 1 REIT or MLP in the portfolio with potential to add a capital gain component to the fixed income mix. With this in mind we purchased 300 shares of Whitestone REIT (NYSE:WSR) to “enhance” the return of the portfolio. All other issues in the portfolio were either baby bonds or preferred stocks. At the time of purchase WSR shares had fallen from the $15/share area to around $12/share which is where we made our purchase. On March 1st earnings were announced and while they were respectable investors did not like them at all–shares fell from the $12.40 to as low as $10 a few weeks later. Obviously the issue that had been added to the portfolio to “enhance” returns was “destroying” returns. The choice was to sell out and book the loss or simply hold since the dividend was around 10%. Of course we held and were rewarded today when we sold the shares for $12.50. This means we collected dividends 38/cents per share and have a capital gain of 46 cents so in total a return of just shy of 7% in about 140 days. So the sale brings the portfolio back up to a 30% cash position which is too high from which to earn a reasonable return. We will add 1 additional long term holding to the portfolio later this week (unknown what it will be at this point in time). Additionally we will be watching for a new issue to replace WSR–a REIT or MLP which has potential to add not only a high dividend, but which also will produce a capital gain within a few months. The week ahead most likely will be dominated by news on tariffs with China. Most of the tariffs to be put on U.S. good will take affect in about 2 weeks and the closer we get to July the more pressure will be exerted on various marketplaces–in particular in the ag sector. We’ll see if there is any progress made solving the trade issue. Right now the equity futures are off 175 points and the 10 year treasury is trading flattish in the 2.9% area. Last week the DJIA traded in a range or around 24,450 to 24,960—I think this is a fairly mild range in reactions to news and we continue to believe that we could see plunging stock prices as we get closer to tariffs being fully enacted. POTUS needs to get off of twitter on this topic and get down to business negotiating a solution–we are not aware of serious discussion with China at this time. For this week we have 4 Fed folks speaking–right now these speeches have been less disruptive than in the past. I guess when there are other worries overhanging the market little importance is assigned to these folks spouting off–up until this week we had concerns with Fed speeches, but now they are held as not important. Monday and Tuesday this week we have no market moving economic news being released. On Monday we have the New Home Sales and on Tuesday we have the Home Price Index and Consumer Confidence being released. We would be shocked if these items were held to be important. On Wednesday we have Durable Goods and Pending Home Sales being released. On Thursday we have the latest revision of the 1st quarter GDP–unlikely to be held important as we have had a number of 1st quarter GDP reports and this one will be within .1 or .2 of earlier reports. Friday we have reports on Personal Income and Consumer Spending, the Chicago Purchasing Managers Index and the Michigan Consumer Sentiment report. Just like the Fed speeches the day to day economic news is totally overshadowed by the Presidential tweets and the “unknowns”–i.e. tariffs and immigration items—-don’t think these items are going away anytime soon. The Fed Balance Sheet assets fell by $9 billion last week which would be “normal”. We had 2 new income issues announced last week. Insurance company Enstar Group (NASDAQ:ESGR) announced a new 7% fixed to floating rate preferred which opened for trading quite strongly around $25.20 and closing the week at $25.28. The issue is trading Grey Market under ENSTF. Some info on the company and issue can be found here. Disclosure–we bought this issue at $25.25–whether we hold it or flip it is yet to be determined. Tsakos Energy Navigation (NYSE:TNP) sold a new fixed to floating rate preferred with an initial coupon of 9.5%. These preferred issues are getting kind of expensive for TNP and obviously this is an issue that the marketplace has deemed pretty dicey. Shares are trading around $24.61 under the Grey Market ticker of TSSKF. We had 6.25% baby bonds from insurer Unum begin to trade last week under the ticker of UNMA–they are trading at $25.10. The average preferred stock moved higher by 2 cents last week and there were 163 issues trading below $25/share. Both of these were close to flat last week indicating we didn’t have much excitement in these markets–but we all know that this can change almost instantly. As we expected Tsakos Energy Navigation (NYSE:TNP) has priced their new fixed-to-floating rate preferred at a sky high 9.50% initial coupon. They are selling 5.4 million shares plus 810,000 overallotment shares. The pricing on the new issue can be found here. The initial coupon remains in place until 2028 at which point it floats at a rate of 3 month Libor plus a spread of 6.54%. As noted yesterday TNP has 4 preferred issues outstanding. Our reader Andrew C notes that the TNP-C issue has a failure to redeem clause. The TNP-C issue which becomes redeemable on 10/30/2018 has a failure to redeem penalty rate kicks in after 10/30/2020 at a rate of 1.25 times the 8.875% coupon. Prior to 10/30/2020 there is a penalty rate of 1.25 of the 8.875% coupon if certain covenants are broken. The 8% TNP-B issue which becomes redeemable next month (July 30, 2018) has the same failure to redeem clause. This means on 7/31/2019 the rate on the issue will go to 10%. Given the large size of the new issue we believe the company will redeem 1 or both of these issues once they become redeemable. Eagle Point Credit (NYSE:ECC) has released a new investor presentation. We are noting this release because Eagle Point has some term preferreds and baby bonds which we, and other readers, own from time to time. We like to review these investor presentations as they do help clarify the business–in this case CLOs (collateralized loan obligations). Investors should be aware while these presentations are helpful they typically have a very company positive “spin”–meaning they should always be read with a small grain of salt. Tsakos Energy Navigation is selling a new issue of fixed-to-floating rate preferred stock. The company has 3 fixed rate preferred issues outstanding and they have coupons of 8% to 8.875%. The 8% issue is callable in July and the “use of proceeds” from this issue includes possible redemption of preferred stock. The 8.75% and 8.875% issues are not redeemable until later. The rate will be fixed until 2028 at a yet to be determined fixed rate and at that point will float at 3 month Libor plus a spread which also is not yet announced. The issue will have a permanent ticker of TNP-F. The issue will trade on the OTC Grey market, although the temporary ticker has not been announced. Here is the preliminary prospectus. Enstar Group Limited (NASDAQ:ESGR) has priced a new fixed-to-floating rate preferred tonight with an initial coupon of 7% which will remain in place until 2028 at which time the rate will float at 3 month Libor plus 4.015%. While the spread in 10 years is a bit lite the 7% current coupon is darned tempting. The issue is non-cumulative which is typical for an insurance company issue–and dividends will be qualified for preferential tax treatment. They are selling 16 million shares with no overallotment shares. NOTE that almost 12 million shares are reserved for specific institutions thus leaving only 4 million to sell on the OTC Grey market. Shares should start trading tomorrow with the temporary ticker of ENSTF. The permanent ticker when it moves to the NASDAQ should be ESGRP. We were not familiar with Enstar and as such did a little bit of homework on the company. They were founded in 1993 in Bermuda (which is typical for many insurance company) and initially they purchased other legacy insurance portfolios–and in some cases entire companies–generally property/casualty companies which allowed the seller to refocus their capital on other business. In 2013 the company entered the “live insurance” business by purchasing a few other companies that are either specialty insurers or reinsurers. This company seems to be a bit more complex than most insurers so potential investors should do some due diligence on the company website here. The company now has assets of over $16 billion with equity of over $3 billion. The company’s long term debt is investment grade (Standard and Poors BBB), while this particular new preferred issue is rated BB+–a notch lower than investment grade. When we compare this issue to more recent insurance company issues from MetLife and WR Berkley which are both rated just 1 notch better and Unum which is rated the same the 7% on this issue is extremely tasty. Pricing for this new issue can be found here. As noted by our reader SteveA, along with other readers, the new Unum Junior Subordinated Notes due 2058 have begun to trade on the NYSE. All the details on the issue and the prospectus can be found here. Shares are trading right around $25 now. This is a large issue of 12 million shares plus another 1.8 million shares for overallotment. We will have no personal interest in these baby bonds as we simply are not buying issues with maturity dates this far out–just too much interest rate risk right now. This doesn’t mean the issue is bad–just that it doesn’t fit with our current strategy of investing (which no doubt will change at some point in the future). We do note that the interest on these baby bonds can be deferred for periods of up to 5 years without being a default–we have NEVER liked these provisions. Is it likely to happen? NO–but who knows over the course of 40 years. The Medium Duration Income Portfolio is now performing exactly as expected. This portfolio was formed in February, 2018 and thus is in the 4th month of existence. At this moment the portfolio is up 1.58% and should approach 2% by the end of the month. Since the portfolio wasn’t fully invested (considered to be fully invested at 90% or so) for over a month a little income was lost the 1st month or two, but now the portfolio is hitting its stride. Recall this portfolio is similar to our own personal holdings–term preferreds and baby bonds maturing in the next number of years, although there are two baby bond with a 2027 maturity. Note that 1 baby bond was called (Arbor Realty) in April and was replaced shortly thereafter with Sutherland Asset Management 6.50% baby bonds (NASDAQ:SLDD) which has performed admirably. This portfolio is set up as a learning tool. When we originally set up model portfolios many years ago they were for our personal learnings–now they are more for “newbies” to income investing–those that want a reasonable return without turning to common stocks, but want more than CD’s. The intention is that the various issues are not “traded”–simply held. A reasonable goal for this portfolio is a return of 6% to 7% in a rising rate environment (although whether we are in a rising or falling environment remains to be seen). While we seldom are concerned when equity markets drop as many times these drops are supportive of the income markets we invest in, we have now entered a period where equity markets can “drag down” preferreds and baby bonds–this occurs when investors bail out of markets out of unfounded fears. Overnight global markets dropped very sharply, in particular in Asia where drops of 2-3.5% were the norm. At this moment DJIA futures are off by 300 as we write and the 10 year treasury is trading at 2.88%. It would not surprise us one bit if the DJIA fell 1000 points one of these days and selling begets selling as nervous nellies leave the market in mass. Certainly the term “trade war” is now closer to being an accurate description for the tariffs now being implemented around the globe, although we think the term “trade skirmish” still is accurate until such time that all the various tariffs are implemented. Here is where we start building a little cash–take a few profits here and there, hold off reinvesting dividends and interest and hold cash in a money market. The good part about holding a little excess cash is we earn 1.75% on the holdings. In the past when we held too much cash we earned zip–and that was much more painful. We are exploring many other concerns which are popping up because of the trade skirmish—-inflation, foreign purchases of treasury bills and bonds etc. as there are substantial potential issues ahead of us–and we had plenty of issues already on the U.S. economic plate. We are gearing up (mentally) for an active week in the stock and bond markets. Almost without question the tariff situation globally and in particular with China is going to cause some pain and suffering in some commodity markets as well as potentially in the equity markets. Looking at the futures tonight share prices are off in most all the markets of the world–although we all know that the futures aren’t worth much in terms of forecasting closing prices tomorrow. Last week we had the 10 year treasury trade in a range of 2.89% to 3.01% closing around 2.92%. Of course the key items we had last week was the Trump summit with Kim Jung-un, the Fed Rate hike and a late week rush to safety as the U.S. announced tariffs on Chinese goods. Of course not reflected in trading last week was reaction to China’s retaliation which came over the weekend. Stock markets were down a bit last week closing around 25,090 on the DJIA–a loss of 220 points on the week–totally meaningless. I have to admit that I thought it was much worse–I don’t pay too much attention to the equity markets unless they have a REAL move up or down (maybe at least 300-600 points in a day). All I remember was the talking heads on CNBC were saying this was the “worse week of the year”–what idiots–I really need to have different background noise in my office. For this coming week we have just 3 Fed presidents speeches—just shut your yaps–no good comes of these folks spouting off. Then on Monday we have the Housing Market Index (builder confidence) and Tuesday Housing Starts are announced for May–both are expected to run hot–but that is the consensus so likely it won’t add to upward interest rate pressures. Wednesday Existing Home Sales for May are announced and on Thursday the FHFA Housing Pricing Index is announced. Also on Thursday the Leading Indicators is announced. We would be really surprised if any of these are meaningful to any interest rate or equity market. We won’t need fundamental economic news to make for some wild markets this week. As we had noted on Friday the Fed Balance Sheet was up $2 billion in the lastest week and thus didn’t contribute to any upward pressure on interest rates. We had 2 new issues announced last week. 1st RenaissanceRE (NYSE:RNR) sold a non cumulative 5.75% investment grade preferred. This issue is now trading on the OTC Grey market under ticker RNREF and is trading right around $25/share. Ohio banker Synovus Financial (NYSE:SNV) sold a non cumulative 6.3% fixed-to-floating preferred from which they will redeem their outstanding 7.875% (NYSE:SNV-C) fixed to floating rate preferreds. 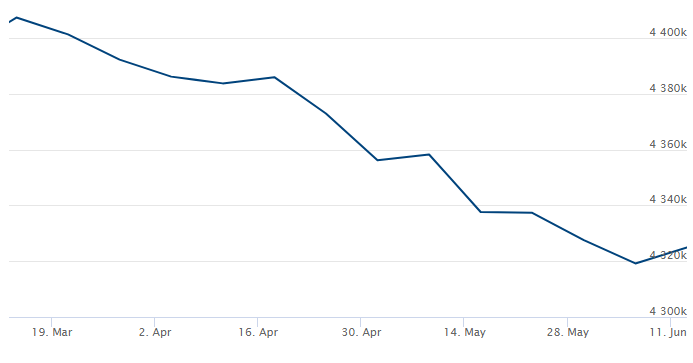 Also the new 7.75% baby bond issue from Cowen (NASDAQ:COWNL) began to trade and is right around $25.05/share. We ended last week with the average preferred stock trading at $25.12 which is up a few cents from the previous week. Additionally there are 168 issues trading at $25 or below–2 fewer than last week. It seems that the only time interest rates fall is when we have an “event” of some sort–in this case the tariffs placed on China. Rates fell into the high 2.80’s before rebounding back up to 2.91%–we watched preferred stocks and baby bonds and there was no reaction whatsoever–flat (overall). Something we have noticed this year is that when interest rates fall income investments stay steady, but if they rise many income investments fall a bit. Obviously investors believe rates are moving higher–at some point in time. Of course if the Europeans don’t get their growth going money will keep pouring in to capture our higher interest rates. The Fed’s tapering programs took a week off as the Fed Balance Sheet grew by about $2 billion last week. So in the last 12 weeks the balance sheet has fallen by $80 billion–at this rate it will take about 10 years to get the balance sheet normalized–don’t think that is going to happen–no way. As we have mentioned before the “run off” in the balance sheet (meaning bonds mature and the Fed DOES NOT reinvest the proceeds) continues to put upward pressure on interest rates. So $80 billion of new money was needed to buy bonds–thus far it has worked out–but 1 small glitch in the process could send rates much higher–guess we will have to wait and see how this plays out. The fixed-to-floating rate preferred from Spark Energy (NASDAQ:SPKEP) has slowly crept higher–day by day as we close in on the ex-dividend date of 6/28. The dividend for this period was declared a month or two ago and it looks like buyers want to lock in a tasty 55 cent dividend. As readers know we are totally overweight this security and are now at (or very near) break even on our total return. Of course with the benefit of hindsight we wish we would have bought even more down around $22. Spark announced lousy earnings last quarter and won’t announce 2nd quarter earnings until the 1st week of August. The company predicts a flat year to last year. This f-to-f issue traded over $27 prior to a reopening of the issue.